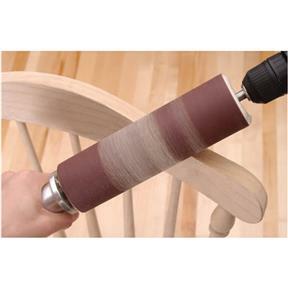 This rolling-pin style Pneumatic Drum Sander is perfect for hand contouring and smoothing projects that are too large to use with a stationary sander. 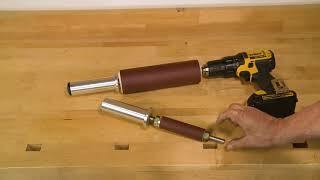 Simply chuck the 3/8" spindle into a portable electric drill, cordless drill or air powered drill for two-handed control. 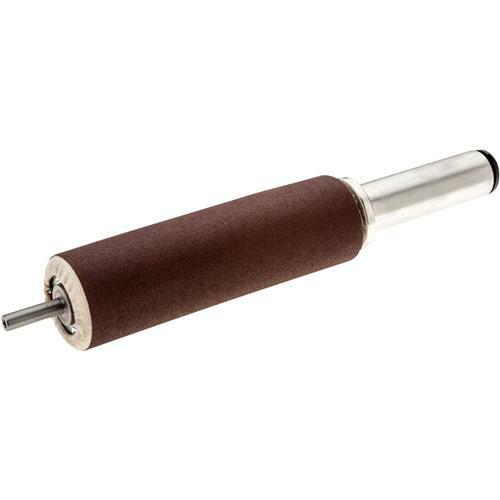 Choose this 7-1/2" x 2-1/4" diameter size for fairing broader areas. Features ball bearing handle and air valve for easy bicycle pump inflation. Second one I've owned, I wore the first one out through use, great tool! This tool is excellent. It works better than I thought it would and is easier to control than I expected. I am using it with an electric drill because my compressor is not adequate for powering it via an air motor. I thought the drill power would make it awkward but its really not bad at all. It will be easier once I get a big enough compressor to power it but meanwhile i find it really useful. I am using it to refine the final shaping of chair parts and do some sanding. If even larger diameters were available i'd get a larger diameter as well. The ball bearing action is nice and smooth, the sleeves work well, the long length makes it easy to manipulate and control, see what is being sanded and reach the areas iI need to reach. I'd recommend this as being as useful as it looks. So far no problems with the inflation of the cylinder... everything I hoped it would be and will work even better for me once i can power it with an air motor. Used these in the 1970's then hard to find. Now I have two. I used them recently to smooth out the inside contours of an elliptical template I made out of 3/8" clear acrylic. This was certainly the best tool for the job. I will use them repeatedly. I've also chucked them up in my drill press, which, with a little jig building, should be good, too. I make wood corbels, lots of inside curves. This thing makes fast work of this job. Love it. I have been using this tool for several years and really wanted a new one while my old drum sander is my backup!